It is that easy to grow your WooCommerce business on eBay using ExportFeed! 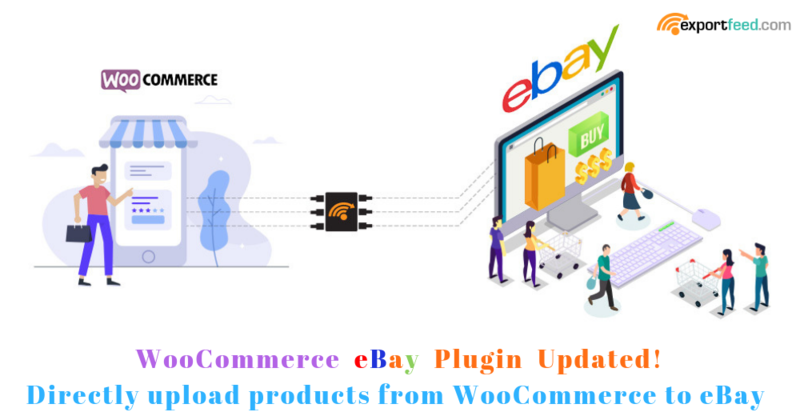 With this version release of ExportFeed plugin for eBay, we’ve added a feature to allow you connect your WooCommerce products to your eBay store. Now, you can create your product list and optimize it for a proper eBay listing that attracts more sales. Listing on eBay is itself is a complicated process if done manually if you are a beginner. With this plugin, you don’t have to go through that hassle any more. You can select products of your WooCommerce to directly upload them to eBay. Also, you can get your error reports and resolutions when using this plugin. Simply, connect your eBay account and the eBay country marketplace, then prepare your product list and upload them to eBay. You no more need to log in to eBay seller account to submit your product feed everytime! Multichannel selling may get complicated. Evenmore when you add eBay to your WooCommerce sales channels. But ExportFeed has solved the main problem. Your product quantity and price on both WooCommerce and eBay can remain in sync. The product feed you create to list products of WooCommerce on eBay will be updated and you can sync those to eBay listing with a single click. The product list or the product feed that you submit to eBay through ExportFeed plugin will be regularly updated based on your WooCommerce product data. Every time you need to submit your updated data to eBay, you can simply click on the submit link after hovering over the feed name on the manage feed section. 1st Feed steup offered free of Cost!